Brand: Brand: Sunshine Books, Inc. Looking for a new way to have fun playing with your bird buddy? Or is his nickname "Birdzilla" and you have the scars to prove it? Maybe your bird is a depressed little perch potato that refuses to play at all? This new way of training birds with a clicker and treats can dramatically change your bird's behavior and improve your life together. 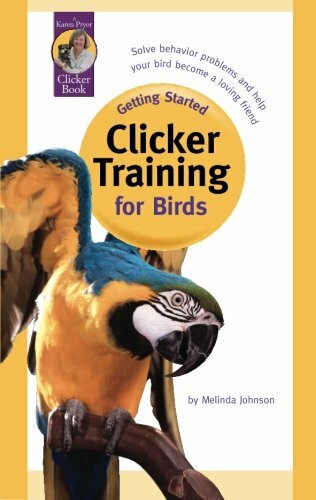 Find out just how smart, affectionate, and fascinating birds can be, with clicker training. * Depressed birds regain their joy in life. * One-person birds warm up to other family members. * Scared birds learn to cooperate with simple care such as nail trimming. * Undesirable behaviors such as screaming and biting fade away. * Baby birds grow up to be outstanding companions. * Rescued and older birds learn to trust, love, and play * Birds win new friends appealing tricks and games Clicker training is wasy and fun! Just follow the simple guidelines in this book. You'll learn to communicate with your bird - and teach your bird to communicate with you - in ways that you never imagined. Manufacturer: Karen Pryor Clicker Training/Sunshine Books, Inc. Publisher: Karen Pryor Clicker Training/Sunshine Books, Inc. Studio: Karen Pryor Clicker Training/Sunshine Books, Inc. If you have any questions about this product by Brand: Sunshine Books, Inc., contact us by completing and submitting the form below. If you are looking for a specif part number, please include it with your message.